1 of 4 Pulse cilantro, lime juice, soy sauce, fish sauce, sugar, garlic and red pepper flakes in a blender until smooth; set aside. 2 of 4 Heat canola oil in a large nonstick skillet over medium-high heat. Sprinkle steak with salt and pepper. Place steak in skillet and cook 4 minutes. Flip and cook an additional 4 to 6 minutes or until internal temperature reaches 135 degrees F on an instant-read thermometer, for medium-rare. Allow to rest 5 minutes. Cut against the grain into 1/4-inch-thick slices. 3 of 4 Meanwhile, prepare rice according to package directions. Spoon rice onto a plate and let cool 5 minutes. 4 of 4 In a large serving bowl, combine rice, cabbage, cucumber, scallions and basil and drizzle with 6 tablespoons cilantro dressing; toss until combined. 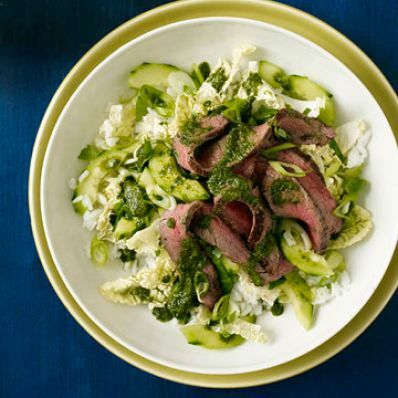 Top salad with sliced steak and drizzle with remaining dressing. Per Serving: 673 mg sodium, 3 g fiber, 3 g sat. fat, 37 mg chol., 29 g pro., 338 kcal cal., 11 g Fat, total, 29 g carb.